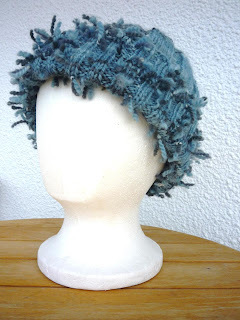 You might not believe I'm a weaver with the amount of spinning and knitting that appears on this blog but this hat is knitted from thrums. I have bags and bags of thrums which I'm trying to think of ways to use up. I tried putting it through the knitting machine but the machine didn't like the knots - it might work to try weaving on the knitting machine. It does take time to hand knit, pushing the knots to one side all the time. 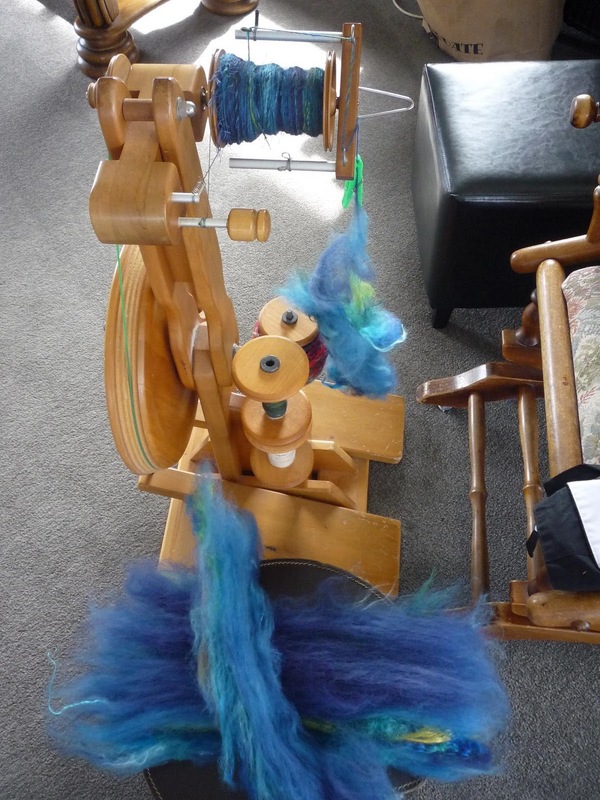 Here we have spinning from batts made from the "compost" heap as seen at Majacraft Magic camp recently. Wonder if GrannyG or Jessica would recognise their hand dyed sliver now. Also bits of silk, rayon and shaggy knitting threads in there. 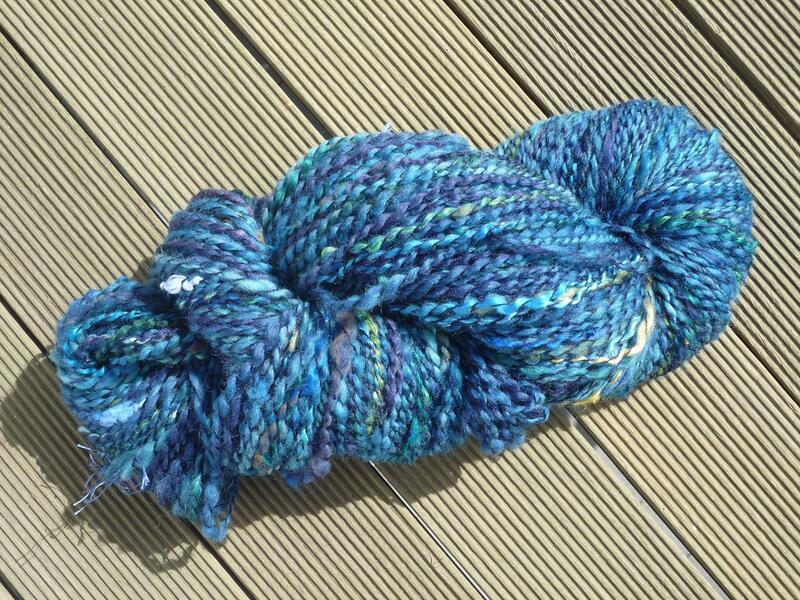 My drum carder is a bit small so I had to divide everything in half and make two batts to get a decent sized skein. I've finally reached the point of deciding what to keep (and what to pass on) of my mother's. Trouble is she kept everything and packed it in the draws real efficiently. Who could pass up this old Patons Woolcraft booklet, cost one shilling. When we in NZ changed to decimal currency way back in ?1967 that would have been 10 cents. This is way older than that because tucked inside were these handwritten patterns, some in my mother's script and some in her mothers, all in fountain pen, of course. Balaclava Helmet for Seamen, Scull cap (Red Cross pattern), Mittens for Fighting Services. 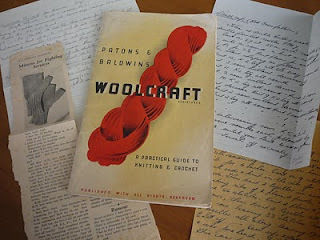 Some of the patterns in the book are wonderful and could find their way onto my needles one day. Actual evidence I have none. So that's all this time, I've got wool in the dye pot which should be ready for rinsing. I'm preparing for a run of blankets influenced by the tui bird. Also have some shibori scarves being woven on the dobby loom but white twill is rather boring to photograph. I expect to see you on Antiques Roadshow with Grans books and patterns. I love the hat too, maybe the thrums would lend themselves to a bag? Jessicah, you'll have to give me a lesson in joining Rav. conversations and uploading photos to groups. Thrums, hmmm maybe I could chop them up and include in the compost to make batts for spinning. It'd take a long time to make a dent.